Born in Brighton U.K. Roger Hubbard is one of the major exponents of early blues and slide guitar. guest performances by Jo-Ann Kelly, Dave Kelly, Simon Prager, Steve Rye, Bob Hall, Graham Hine, Andy Fernbach and Tony McPhee. In December 1970 Roger opened for Muddy Waters in Brighton. 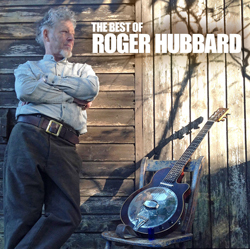 “Roger Hubbard is as good as any blues guitarist in the U.K. or the United States”. included new albums from the legendary bluesmen : Son House, Sam Chatmon, Yank Rachell and Bill Williams. Nick Perls was a key figure on the American blues trail, rediscovering the likes of Son House and Skip James. His song “Home Lovin’ Man” was recorded by US blues man Eric Bibb on his 2003 album Natural Light .